I am thankful Family Friendly Gaming was provided a download code for Now I know my ABCs on the Wii U. This indie learning game will help kids learn the alphabet. The best comparison I can make to Now I know my ABCs is those pieces of paper with the dotted versions of the alphabet. 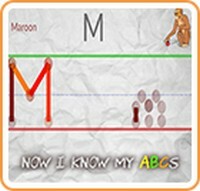 Now I know my ABCs draws the letter for you, and your child can use the stylus to write it. Now I know my ABCs contains the alphabet from A to Z. It even sings the alphabet song while your child is deciding which letter to work on. From there you child will go to a screen with the upper case, and lower case letter. How to draw it is slowly shown to the child. I suppose an adult could use Now I know my ABCs. I know some of ya'll are out there snickering. Some adults have learning disabilities and Now I know my ABCs could be good for them. There is also an image on Now I know my ABCs, and a word. The word is something that starts with that letter, and the same goes for the image. Tap on the image to hear that word sounded out. After drawing the uppercase and lower case letter there is not much else to do on the screen. Kids can tap the Skunk Software logo to hear the company name said. They can tap the image, or the next letter. Please note there is no next letter on the letter Z. I thought maybe Now I know my ABCs would have one and it would start at the letter A, or maybe take me back to the main screen with all the letters and the alphabet song. I tapped all over the place and even hit all of the buttons on the Wii U Gamepad. Now I know my ABCs did bring me back to the main screen. Not sure if it was a button or just a time out issue. Maybe a bit of lag? Graphically Now I know my ABCs is very indie. I liked the music, and the alphabet song will get stuck in the head. I was singing it a bit after playing Now I know my ABCs. It got into my head. I like how the letters are sounded out in Now I know my ABCs. This downloadable only home console video game is a solid learning title for children trying to learn the alphabet.